Marinated Tomatoes, my version of Russian quick pickled tomatoes (маринованный помидоры). It’s an easy and delicious way to prepare tomatoes. A cross between fresh tomatoes and Canned Pickled Russian Tomatoes. This recipe needs to remain refrigerated, and gets tastier the longer it marinates. Pickling vegetables is a staple in Russian foods. Cabbage, cucumbers, tomatoes, carrots, potatoes and garlic are all staples of the Russian diet. A salty brine is used to preserve vegetables, such as whole tomatoes for the winter. Now that I’m all grown up (which is up for debate) and have a garden of my own, and usually I have lots of ripe heirloom tomatoes that I need to make something with. 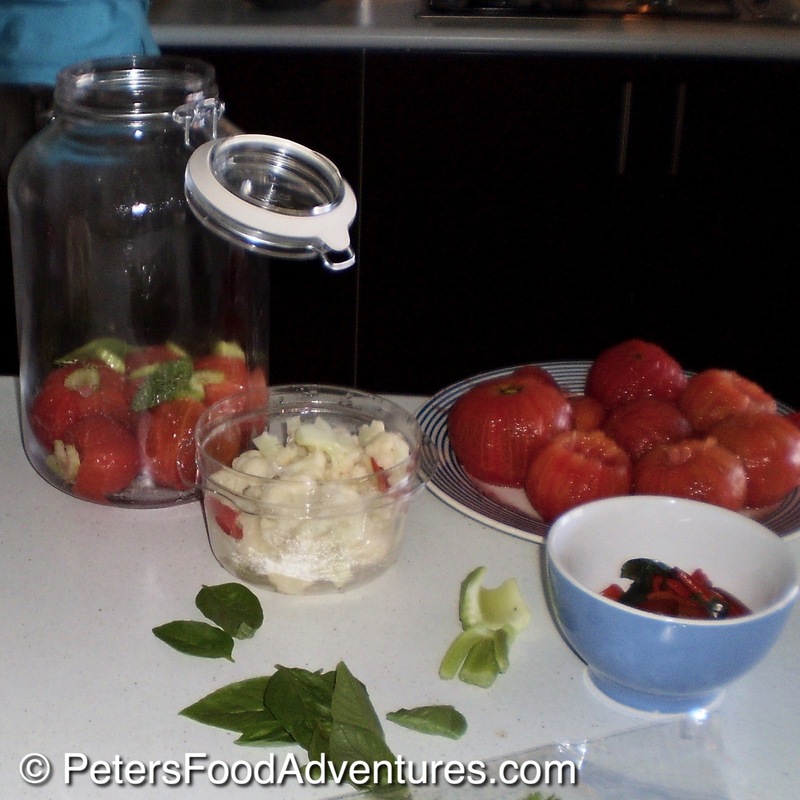 This recipe is a version of my mum’s friend, Maria’s pickled tomato recipe. I’ve known Тетя Мария my whole life, and she is an amazing cook. This easy marinated tomatoes are a flavor explosion, and I don’t miss a tomato season without making it! Heinz Ketchup is the perfect addition to my Marinated Tomatoes, as it has spices, sugar and vinegar in the ingredients already, adding a tangy pickled taste to the tomato sauce. I love the flavor of cilantro, dill and basil infused with the Heinz Ketchup mixture. The longer the tomato marinates in the mixture, the stronger the flavors are. Try to leave this for one week before eating to allow time to marinate. The cilantro is the hero herb flavor in this recipe, don’t be afraid to for flavor. I love to eat these marinated tomatoes with a Rice Pilaf or Plov. They are also great as a side dish on your plate next to potatoes, especially with heartier and heavier meals. The whole marinated tomatoes burst with flavor, it replaces a salad for me. You could use lots of small cherry tomatoes, making the tomatoes bit sized as well. The flavors after 1 month in the fridge are absolutely amazing! (if they last that long in your fridge!) The tomatoes keep their ‘just picked’ juicy freshness, full of flavor, just asking to be mopped up with crusty bread. Keep the Marinated Tomatoes refrigerated, they cannot be kept on the shelf or pantry. I think Marinated Tomatoes is a fresher, improved version than the Pickled Tomatoes that I grew up with. I now grow my tomatoes specifically for this recipe. I’ve play around with the ingredients, usually adding sliced carrots and red peppers, but I have added blanched cauliflower florets or whatever vegetable is in season growing in the garden. It’s like a marinated tomato giardiniera. I can’t get enough of this recipe, I’m sure you’re going to love it too! Bon Appetit! Приятного аппетита! Wash the tomatoes, remove the stems and carefully remove the core. Removing core is optional, I love the juicy burst of a whole fresh tomato when biting into it. Peel carrots, chop into thirds, then quarter each piece. De-seed bell pepper and slice into medium strips. Prepare 3 Litre glass bottle by sterilizing it in a large boiling pot and let cool. Place a base of cilantro, basil and dill in the bottom of the glass bottle, about 1/2 of your herbs. Place a single row of tomatoes on top of the herbs and add about 1/3 of your garlic cloves, chilli peppers, bell pepper and carrots. Place another layer of cilantro and dill, with a black currant leaf. Add another layer of whole tomatoes and vegetables and repeat process until the jar is full and packed tightly with tomatoes and vegetables. In a large pot, combine 1 litre of Heinz Ketchup and 1 litre of water. Add bay leaves, peppercorns, salt, and bring mixture to a rolling boil. 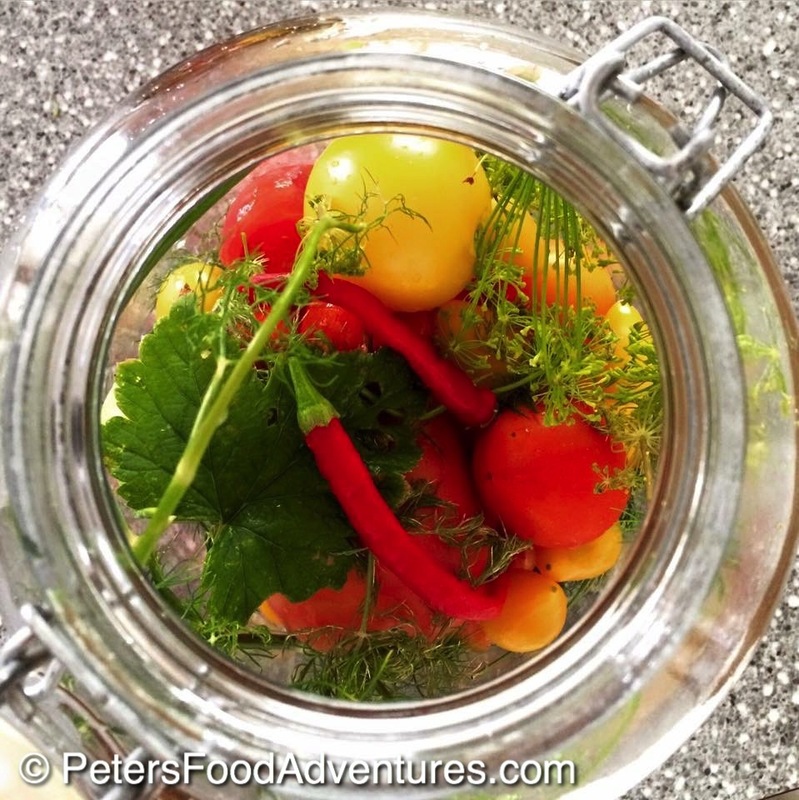 Close the lid, and leave hot tomato filled glass jar on the kitchen counter overnight to cool. The following day, put the salted tomatoes in the fridge, where they should keep for up to six weeks. Save some of the leftover tomato sauce to top up the jar. After you fill the jar and allow to sit for 24 hours, the tomato sauce levels decrease. You want to keep the tomatoes covered in sauce. If you do make it, be generous with the coriander, dill and basil layers, then the tomato vinegar juice tastes amazing. I could drink it! I’m not a huge fan of coriander, I know a lot of Russians who use it in their cooking, especially for shashlik, but I wasn’t really brought up on the spice….I prefer it in Indian food, but not so much in authentic Russian food. My dad was my hero, he was the one who had the gift of cooking, I trusted his taste buds, everybody in the Russian community raved about my parents cooking, because the tastes were there, if you get that wrong yr food is bland. Some people like bland food, but I’m not one of them. When my dad did the салонина the tomato sauce based one, he used bay leaves, peppers, vinegar, sugar, home made tomato sauce, dill, and garlic, and salt n pepper, he would’ve used a few other spices, but I’m not sure which ones, better find out from my other Fam…he also did pickled vegetables, and that was sooo yummy. That was vinegar based, with cauliflower, celery, garlic, peppers, cues, cabbage (not savoy) & thick strips of carrot. We used to eat it with Липский, &тукачи, dipped in the sauce…..
Wow! Sounds delicious! I know what you mean about coriander. I only recently started liking it, it was actually this recipe that made me like coriander. I’ve never had it with shashlik, sounds awful! It’s great to get our parents recipes if we can. Nostalgia!